Rather unlikely. You can uninstall it to be sure. You can reboot the smartphone. You can check Settings > Audio > Output and make sure the speaker has an activated output plugin. 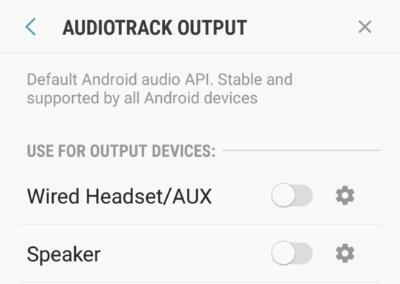 You can choose Audiotrack output there, this is Android Standard. I meant uninstall the skin, not Poweramp. But you also can uninstall and reinstall Poweramp, you won't lose any music. Music is not stored in the app. However you will lose any internal (database) Playlists and Settings if you uninstall the app - both of which you can Export before you uninstall. just have to make up my playlists again. Did you not Export them before uninstalling as I suggested? If there is storage for music on your mobile, there is storage for exported playlists too. You see, a mobile isn't fundamentally different from a computer these days: basically it is a portable computer, and there is a filesystem to store data. When you use the Export Poweramp Playlists feature, any playlists that you may have created within the app (i.e. ones that are stored in PA's database, not from already existing files) are exported as .M3U files to the Playlists folder on your device storage. You can then copy them to your music area on your SD Card if you want, or just allow Poweramp to use them from where they are.